Genesis (Grade 3 - Score Only). Composed by James Curnow. For Concert Band. Curnow Music Concert Band. Grade 3. 28 pages. 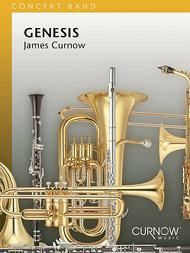 Published by Curnow Music (HL.44007403).You'll appreciate the creative and sensitive compositional technique in James Curnow's engaging new work Genesis. The piece gives your grade 3 band the chance to shine in many ways as it progresses through many styles and moods. Exciting and expressive moments for every section display the versatility of your band to excellent advantage. Masterful orchestration and several nice solo passages add to the depth and breadth of the music, making this possibly the nicest new work to be published this year. The more you study it, the more you find to like. Genesis composed by Vince Gassi. Concert Band. Concert Band; Score. Belwin Symphonic Band. Form: Overture. Grade 4.5. 44 pages. 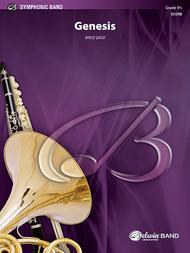 Published by Belwin Music (AP.32540S).Genesis provides ample opportunity for your band to explore diverse colors and textures, from the mysterious opening which features solo piccolo, to exotic woodwind runs in open fifths; from a delicate lyrical section to a furious dialogue between winds, brass, and percussion. There is plenty of energy and excitement in this work to captivate your audiences. A brilliant new work from the pen of Vince Gassi.Concert/Contest; Festival.